Welcome to Rocky Hill Chiropractic and Dr. Allen Maryott. We treat low back Pain. Dr. Maryott Can Solve Your Low Back Pain! At this moment you are probably experiencing just how debilitating low back pain can be. Every movement is difficult. You probably feel old. By far the most frequent causes of low back pain are overstrain of muscles and ligaments or misalignment of the joints of the lower spine. These conditions respond very well to chiropractic care. But low back pain may be the major symptom of serious bone injury or organ disease. To be sure that chiropractic is the best treatment option for your condition it is essential to distinguish between strain of the muscle, joints and nerves and more serious conditions that require more heroic intervention. Pain made worse (or better) by movement is the chief symptom of low back pain from strain or misalignment. If you can't bend over to tie your shoes it is obvious that movement affects your condition. But some conditions are more subtle. Palpation is the use of the hands to diagnose. Frequently it is necessary to touch the affected muscle or joint to determine if movement contributes to the pain. If uncertainty remains after a thorough palpatory exam, more technological diagnostic procedures such as x-ray, blood tests and MRI are always available. Palpation is the major diagnostic technique I use in my office. It has many advantages. It is simple and inexpensive. It is easily understood by the patient. It confirms the reality of the complaint. (If I can feel where it hurts then both you and I know the pain is not 'in your head'). But the most important advantage to diagnosis by palpation is that it is specific. This muscle, the quadratus lumborum, is tight and tender. 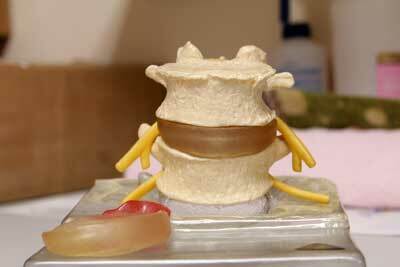 This joint, between the fourth and fifth vertebrae in the lower spine, is misaligned. This muscle, the gluteus medius, is weak indicating a possible irritation of the L5 or S1 nerve roots. Specific diagnosis allows treatment to be specific as well. In the more than 30 years I have been practicing, I have found that the best results are achieved by a combination of gentleness and firmness. Chiropractic means 'to do by hand.' The hand is the best instrument to combine diagnostic sensitivity (gentleness) and decisive therapeutic intervention (firmness). The most common causes of low back pain are muscle/ligament strain and joint misalignment. These conditions are characterized by pain aggravated by movement. Chiropractic and other hands-on therapies, such as myofascial release, acupressure and exercise, provide quick and lasting relief. The most serious injury to the spine occurs when the vertebral disc is damaged. The intervertebral disc has been compared to a hockey puck with a soft center called the nucleus pulposus. In younger adults violent trauma can tear the 'hocky puck' and squeeze the soft center out into the spinal canal causing severe pain, loss of reflexes and muscle weakness. These injuries frequently, though not always, require surgery. More commonly in older people the disc wears gradually and the damage progresses through stages. The first symptomatic stage occurs as the disc bulges putting pressure on the nearby ligaments and nerves. Pain can be local or radiate down the leg. Because of the gradual onset these conditons are treatable and reversible if taken care of early enough. Once the disc has become damage, treatment takes longer and home exercise becomes more important for full recovery. providing instruction for home self care and exercise. I explain what the problem is, the purpose of each therapeutic procedure, the expected result of each procedure and what you can do for yourself. Unlike many doctors I emphasize your role in getting better. This includes not only giving me the detaiilsof how the condition started but also giving me feedback during treatment and what to do or not do at home.